This post is part of a series on problems I’ve encountered with financial advisers and my day 5 blog post for the #YourTurnChallenge. One of the weirdest encounters I have had with a financial adviser was a sales call after the completion of a financial plan. Though the adviser had championed the concept of prudence in financial decision-making, the adviser's assistant called to ask me whether I wanted in on a high-flying tech stock mutual fund. I typically don't buy anything, investment or otherwise, that has an expiration date on its offer for sale. In this situation, the fund was soon going to be closed to new investors. So, the adviser wanted to let me know about this great opportunity. And I needed to make a decision quickly. Certainly, diversifying my portfolio was one of my goals, and one of the goals set forth in the financial plan. But making a rash decision to purchase what was likely an overvalued mutual fund wasn't what I had in mind when I envisioned becoming diversified. Still, I asked my husband what he thought. We decided to decline, collectively shaking our heads at the odd sales pitch. Note that the offer was made at the end of 1999 when tech stocks were highly valued. Now, I have made plenty of poor decisions in my life but buying tech at all-time high was not one of them. Buying well-performing stocks, mutual funds, or ETFs is tricky. To me, there's nothing wrong with buying shares of growing companies. What can be difficult to know is whether the company's stock price is overvalued and whether skyrocketing growth will continue. In this situation, though, many tech companies weren't even turning a profit; sadly, others were misrepresenting sales figures. Generally, buying a security because of recent past performance is called “chasing performance.” In this type of scenario, I could end up buying shares at a price that is too high and then dumping them when the price has declined. In addition, I don't like it when financial advisers recommend a fund based on its recent performance. A fund should be recommended based on factors such as its low cost or its ability to fill a particular spot in a desired asset allocation. A financial adviser shouldn't push me to act quickly, particularly for an exclusive deal or a time-limited offer. Whether or not my adviser or I can uncover opportunities is one problem. But there are always going to be opportunities to make money in the stock market. There's no rush to buy if I'm not ready or I suspect high demand has pushed prices too high for now. 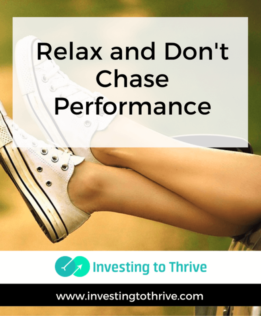 A big part of an adviser's role is to keep people from chasing performance. In this situation, I had to act as my own adviser by rejecting an performance-chasing opportunity that would have disappointed me.